We are a group of management & early childhood professionals, who believe your child’s learning and success is part of our success. Our philosophy defines the purpose of our educational system and serve to remind us that the development of every child is fundamental. Hence, we belief every child is unique with different abilities, learning needs and interests. 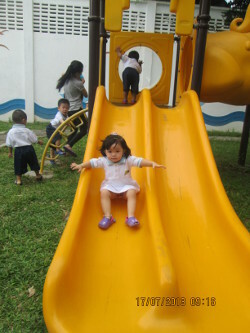 Through our child-centric approaches we focus on individual development. By doing so, we encourage active and holistic learning in every child. We advocate the importance of quality early childhood education at the early years and the early intervention of character building as it lays the firm foundation for their future. We offer infant care (2 months to 18 months old) and child care services for children aged 19 months old to 6 years old. Infant care only available at Serangoon branch. Depends of each infant’s age, meals are provided on demand basis. Parents to provide own milk powder, diapers and other personal consumables. Please obtain infant menu from your respective infant care centre. We provide 3 healthy meals a day. Breakfast (8.15am), lunch (12pm) and snack time (3.30pm). Please obtain child care menu from your respective child care centre. The infant program emphasizes on holistic development of infants’ emerging physical, sensory-motor, perceptual, cognitive, language and social-emotional skills. The framework follows the early years development framework by Ministry of Social and Family Development (MSF). We aim to have secure and confident infants through our holistic program, professional and engaging educarers with strong partnership with parents and family. 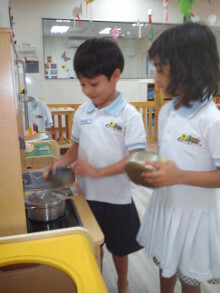 The Early Years curriculum largely prepares students for the 3-6 edition, therefore many of the thematic units are based around the same subject matter. The six content learning areas are also addressed throughout. 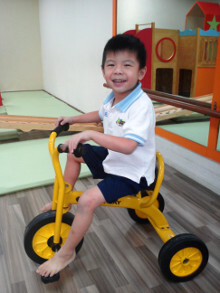 Language arts, physical development/motor skills and music and movement are taught daily. Visual and creative arts, science and numeracy and taught at least 3 times per week. 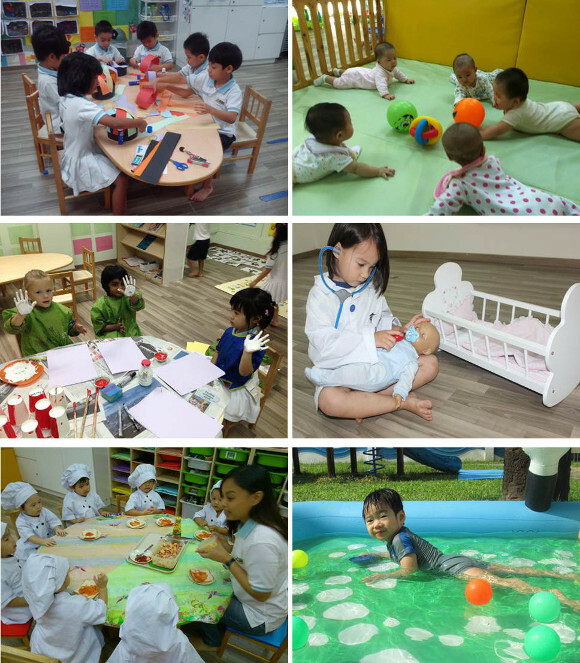 The curriculum is based on proven and peer reviewed concepts that include play, inquiry and objective based learning styles. There are five underlying themes and objectives of the IPC which are designed to cultivate critical thinking, raise self awareness, promote an understanding of other cultures and encourage internationalism and multilingualism. The IPC takes the prevailing view that the first few years of a child’s life provide a vital opportunity for development. The IPC involves family and parents wherever possible in understanding and facilitating the objectives of the organization. 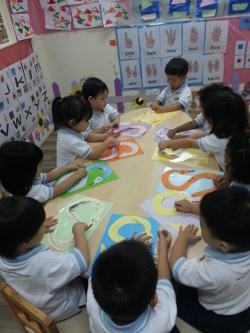 Picket Fence Chinese curriculum focuses on the cultivation of the children’s multiple intelligences. It looks at the holistic development of children’s critical thinking in their early years and addresses their age appropriate developmental in language arts, socio-emotional skills, numeracy, creative and visual arts, sciences and fine/gross motor skills. The curriculum underpins our emphasis on character development and moral values. Professor Skinner has over 20 years of experience in the field of education – as a private school owner specializing in meeting the individual needs of students, as an educational consultant assisting schools in improving their quality of education and as a professor to post graduate students pursuing Masters in Education programs. Dr. Reynolds has dedicated her professional career to early childhood education and has been involved with various forms of curricula development and teaching for more than twenty years. Dr. Reynolds has an interest in Special Educational Needs (SEN) and continues to conduct and publish research in the field. She also works directly with the Head Start Program in Illinois as a consultant. Dr. Burton has pursued a passion for early literacy. Dr. Burton’s focus on literacy culminated in the publication of a literacy based curriculum that focuses on phonics, sight words and early reading. Prior to pursuing her doctorate degree in Education, Dr. Burton was an elementary teacher and an assistant principal. We are proud to announce that Picket Fence Education has been awarded with the following recognitions. 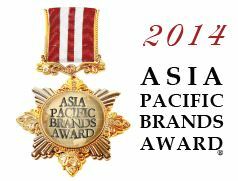 It is awarded for satisfied the requirements by the honourable panel chaired by Mr Vikram Nair (Nominated Member of Parliament), Trade & Industry Association (Singapore), Asia Business Journal & APB Singapore. The Promising SME 500 Campaign was spearheaded to recognize the exceptional achievements of business men and women in Singapore, highlighting their commercial success and also recognizing their contributions to the economy and the community at large. This campaign also serves as a platform to inspire aspiring entrepreneurs to likewise pursue their dreams and ultimately to create a sustainable entrepreneurial culture in our nation. The Campaign Advisory Panel and main organizers include industry top executives and consultants from the fields of Banking and Finance, Human Resource, Academia, Politics and Business Management. Through SMBA, this campaign is also closely affiliated with students from top Local Universities such as NUS and SMU – and is dedicated to supporting youth entrepreneurs and youth business clubs such as the NUS Entrepreneurship Society (NES) in their efforts to promote entrepreneurship among the youths and young adults in Singapore. The Industry Star is recognized for their exceptional achievements and contributions to specific industries. Being brand leaders in their fields, these companies have attained high levels of customer service, a strong brand name and offers unique solutions that are based on innovation and best industrial practices – cementing their position as role models for others in the industry to emulate. Each year, the Promising SME 500 Brand Campaign features these top SMEs under the Industry Star Category, presenting them a well deserved platform to showcase their products and services and bringing their brand reputation to a whole new level. The awards are in recognition of our achievements both in Singapore and in the region as a quality early childhood education provider. We would like to take this opportunity to thank all our parents, partners and staff who have in one form or another contributed to us achieving these recognitions. They are a testament to our continued commitment in improving our quality of care to those that matter most, our children.